The Chevrolet Volt is one of the top contenders in mass-market electric vehicles. 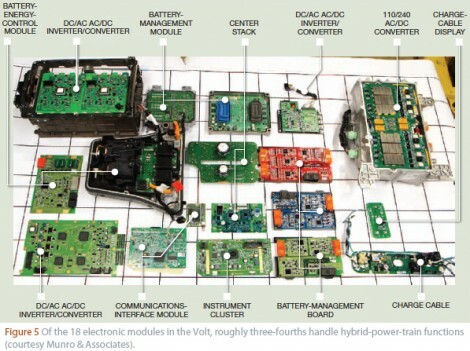 Now you can get a look at the components that make up the electrical system with this Chevy Volt teardown article. The adventure starts with a look at the 288 cell battery. It forms a T shape and takes up the space that forms the hump down the center of the interior of a vehicle. Theses have a liquid cooling system build into the enclosure to make sure things don’t get too hot during use or charging. The sights are then set on the control and monitoring hardware, and there’s a lot of it. In fact, the image above is an overview of the eighteen modules that pull the new plug-in EV technology together. If you’re brave enough to void the warranty on one of these, this should be a helpful road map to get you started. Has anyone seen a teardown of the home charging station for one of these? Far cheaper to buy a Old Civic and install a EV kit. Actually it’s cheaper to keep the civic gasoline and drive for 20 years on the price difference in Gasoline at $6.00 a gallon. As the Volt is the exact same size as a Civic 4 door, they are the exact same class of car. Depends on what your time is worth and what your skill level is. The idea here is it’s a car with (next to) no bugs that you can buy. If I paid my self my full rate, it would be cheaper to just buy the car then to pour a few thousand hours into a polished, finished car with a heat pump based climate control system that both heats and cools the car. Your conversion will be a compromise unless you spend more time than a new car is worth. Plus, try and take your EV on a road trip. Oh, you can’t. Unless you tow a ‘not certified for road emission use’ generator, which is not legal for the most part. Wonder what the carbon footprint was to build (and eventually dispose of) one of those cars? I’ve always wanted to see a breakdown of this. What IS the environmental impact of electric/hybrid vs gasoline car from start to finish, to include the impact of mining materials (including those used to produce the batteries), equivalent energy generation, and eventual disposal? My concern has always been what happens to the batteries once they can no longer be recharged. I’ve been told they get recycled but never having done it don’t know how true that is. Obviously there would be something in place for disposal of an electric car (and batteries) just as there are methods for more common combustible engine cars. Do you really think that every car does not have on-board chips like this too or are you from a country with camels? China literally levels entire mountains to get the lithium used in batteries. You also have to consider where your electricity comes from. And don’t forget battery replacement costs $8,000. FWIW, The Prius is purported to be one of the most un-green vehicles on the planet with regard to toxicity of materials and the relatively low percentage of recyclable content. I can only imagine that the Volt is worse. It is my opinion that the future in automobiles is the all-electric drive train. With it, you get high efficiency, all-wheel drive, and easy-to-implement regeneration. The problem is what you energize that drivetrain with. Rechargeable batteries are not, and never will be, suitable for anything but short-range delivery-fleet use. It’s not about technology, it’s about the laws of physics. If you want to be able to “reenergize” a depleted vehicle, and do so over a time interval comparable to a gas-pump stop, the amount of power that must be pushed through the connector/interface is simply unmanageable. You either need very high voltage– which brings dielectric problems and inherent safety risks, or high current– also potentially dangerous and subject to high I^2R losses. I believe that the only automotive-compatible power source for an electric drivetrain is a properly-engineered fuel cell. With the fuel cell, you retain your rapid gas pump stops, and if you use alcohol, your water vapor and CO2 emissions are effectively carbon-neutral. As a bonus, we already have an extensive infrastructure to handle the distribution of a liquid automotive fuel, so changeover costs are minimized. Until fuel cell technology is mature and manufacturing is scaled to the point where they are actually affordable, attempts by the government to subsidize or otherwise ram conventional rechargeable electric vehicles down people’s throats is a waste of time, effort, materials, and money. It’s an example of lamest form of environmentalism, where the end game is to allow people to feel good about saving the earth, when they’re actually not. Since when does driving an EV mean your trying to save the planet? I drive an EV because I’m a high mileage driver, needed a new car, and wanted to save some money. Would I rather have spent $14k on a Kia Rio? Sure, but I drive about 20,000 miles a year. Over the lifetime ownership of my Nissan Leaf, I’ll spend about $4,000 in electricity vs. $28,000 in gasoline on the Kia (plus oil changes). Also, the Leaf only cost $12k more than the Kia, leaving $12k in my pocket. Interesting note: Some high-end, high-power uninterruptible power supplies use flywheels provide carry-over energy while a generator starts. I recall some guy down in the states that designed a carbon-fibre flywheel battery – float the axles on magnetic bearings in a vacuum casing, and then you have energy storage that charges as fast as you can spin it up. The flywheel TERS (tire energy recovery system)system used in formula one charges and discharges very fast the technology exists but governments are slow to implement or mandate these things due to the Gas Tax revenues that the US Government has relied upon for revenue. The less gas used the less revenue in the TAX coffers. It works,but again the Flywheel system originally developed at Fermi Lab in Illinois with a carbon fiber container for allowing fast charge and discharge in particle accelerator physics testing is not cost effective for the current auto market. I would hope that this technology is available in the next 20 years but our lifestyle is changing, The internet and Skype makes being connected over larger distances easier. We are driving fewer miles and buying fewer cars. My niece who lives in Chicago, works for a VC firm and doesn’t even own a car. What is the way forward? I believe that a modular car with energy storage areas and standards that would allow for anyone to choose a system that is best in class would be the solution. Right now manufacturers are locking you into their design without the ability to cross platform standardize on the interfaces the space requirements and or energy storage size, location and or connection and replaceable devices to ease service and future upgrades. are the best path for a brighter future. Fuel costs would be more like $2,000 – $2,500 per year for the KIA Rio. congrats on the -$2,000 energy savings. sorry but 20k per year is not that far. CHAdeMO and the 10s of thousands (and growing daily) of electric car drivers worldwide disprove all your points of it not being feasible. It is not environmentally friendly. That is why they call it the Chevy COAL. Why not go for hydraulics and ICE? The ICE can act as a powersource and run at its optimal RPM, the hdraulic motor and a swashplate can act as a continously variabl etransmission and use a carbon fiber hydraulic tank for regenerative breaking. A division of our company was pursuing this and the amount of conversions to CNG and LNG wiped out the market for this drive train as the overall cost of the CNG and LNG were so low as to not justify the energy savings that was seen for the driving that was being done. The conversion ran out of business the hydraulic power trains and the groups that were developing them- Lookup the Ford Hydraulic launch assist and or the DANA hydraulic power recovery system that was supposed to go into the garbage truck market. Both of these projects killed by CNG – Look at Canadian vehicles with the dual CNG or GAS capability. Maybe it’s semantics, but I have to point out that the Volt is not an EV but a plugin hybrid. Also, I doubt that battery-powered EVs will ever compete with the ultra efficient subcompacts as far as “greenness” goes. 1) The charge still has to come from coal or natural gas power plants. 2) Lithium cells are tremendous fire hazards, and 3) the safer lead acid batteries have their own ecological problems (you know lead and acid). Now, an array of carbon nano-fiber super capacitors charged by fusion power would be a game-changer. Too bad that tech is still 30 years (at least) from widespread implementation. The Volt is an electric vehicle. The ‘engine’ or whatever you may call the propulsion system runs 100% on electricity, and it is – in fact – a vehicle. Are you saying it’s a hybrid because of the gas-powered generator which you can use to recharge if you run dry? Because that’s still not a hybrid, it’s a generator-recharged EV. Now, if that gas-powered generator directly drove the wheels when the EV power died, then it would be a hybrid. Actually, by definition,it is in fact a hybrid. I realize that Wikipedia isn’t the be all end all, but here it is. There are several electric vehicle communities that support this also. To be 100% accurate, you have to refer to the Volt as a Plug-in Series-Parallel Hybrid Vehicle. Under certain situations, the gasoline engine will directly tie into the transmission to propel the vehicle. Well its not a hybrid if you don’t use gas. I get tired of the thing telling me to refill. NO, I want to drive around with an empty tank. Not to beat a dead horse on a year-old thread, but just because you will not fill the tank with gas does not mean it is not a hybrid vehicle. Beyond that, why would you purchase a vehicle with the option for gasoline backup if you have no intention on using it? Would a full electric vehicle not be better suited for you then? This would have the inherent benefit of not carrying around the extra weight of a gasoline generator system, which in your case would degrade from having not been used, also providing a weight savings / electric range increase. Some countries do have almost no coal or gas power plants. Sweden has 37% nuclear and 26% renewables in its energy mix. Our domestic production was 58% nuclear and 41% renewables in 2004. Also, the energy mix of the grid can change! No one buying a $50,000 auto is doing to DIY the battery charger. Especially when the battery fires are the key selling point. EV owners all over the world are building Charging Stations for their EVs with the OpenEVSE boards. It has already been tested and is in regular use with the Nissan LEAF, Chevy VOLT, Plug in Prius, and Mitshubishi I-MiEV. It will soon be tested with the TESLA roadster and the BMW Active-E.
zhen: An EVSE is not a charger. It is just a contactor, a couple plugs, and a square wave generator. Stupidly simple. The charger comes with the car and is internal.